Sweet little baby Jesse, 10 weeks old. I purposefully disconnected this summer to connect more with my family and like that the summer has flown by! And what a great summer we had, but wow! 3 months since my last post?! 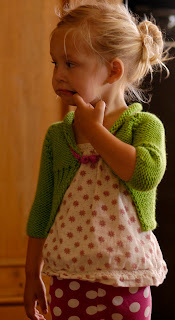 Although I've been disconnected in the technological sense I haven't been disconnected from knitting and here's my latest design... a stylish end of summer jacket for the little one. 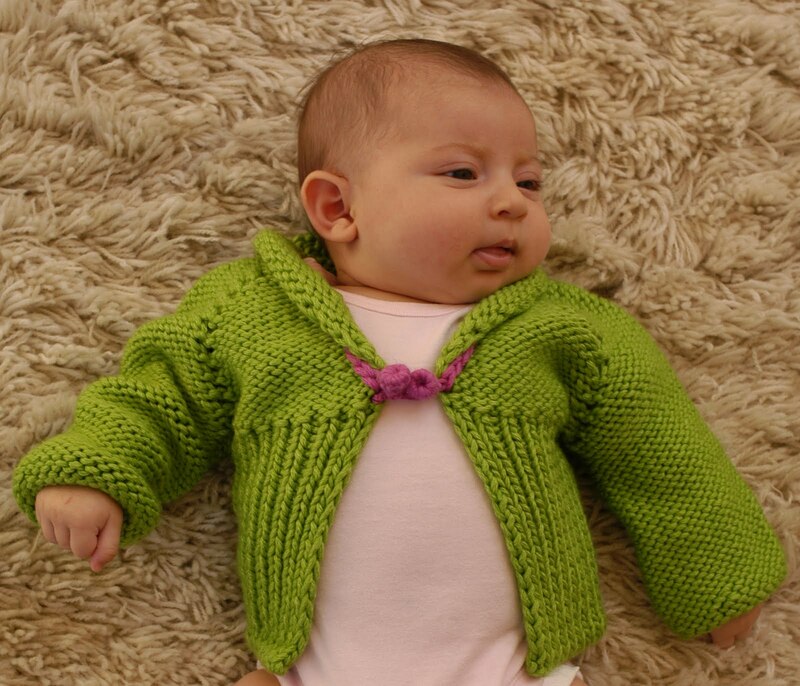 Before I had kids I made the mistake of making a friends twins matching sweaters that were sized 3 months. I just wasn't thinking about how fast they grow! It was a lot of work for such limited use I learned my lesson with those, although their mom really cherished the sweaters and that made it worth it. someone didn't last long for this photo shoot! 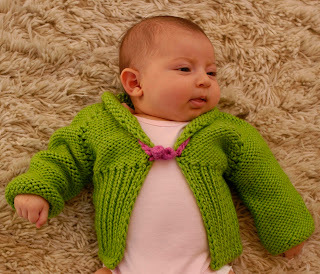 So with a few late summer babies to knit for I wanted to make something that would get used a little longer. 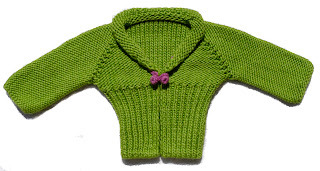 Designed with a growing baby in mind this long sleeve jacket for a newborn becomes a cropped 3/4 length sleeve jacket for a toddler. Worked top down in a raglan style the upper body, sleeves and mini shawl collar are in reverse stockinette stitch while the lower body is worked in a 1x1 rib and finished with a kitchener bind off. One of the best things about it is it only uses @ 218yds (@199m) of a bulky weight yarn with #10.5 needles also used #10 for the ribbing & #8 for the kitchener bo. I used Cascade's Venezia Bulky but was sadly informed that this yarn, a wonderfully soft merino/silk combo is being discontinued. 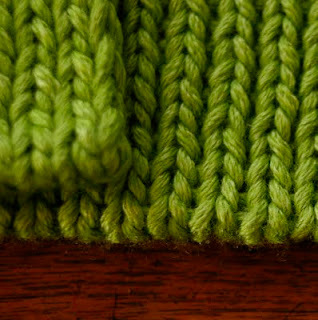 They do carry this in a worsted and a sport, which ironically I used for Wilhelmina's Baby Sweater the worsted same color too! Subconciously I must have something for this green. The use of different increases & a kitchener bind off being the most difficult parts of this jacket would make me rate it for the intermediate knitter, but with the bulky yarn it's a quick knit... good thing too since my list of babies to knit for keeps growing! I thought the handmade buttons helped complete the look. 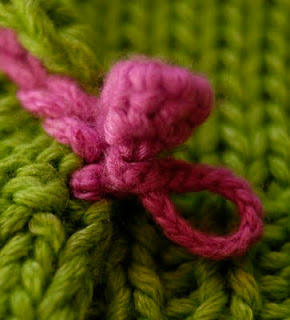 A simple slip stitch crochet button loop. A crochet chain piping in a contrasting color around the neckline & under the collar gives a hint of color. 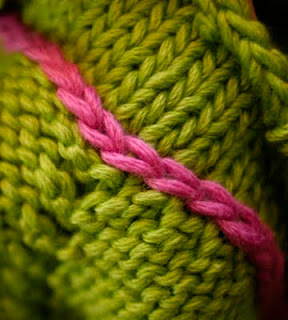 The kitchener bind off, a nice polished finish. Awwwww...beautiful on big and small babies. Always a pleasure, and worth the wait! This is just so lovely and the colour is very refreshing. Personally I tire of baby pastels and pink/girls & boys/blue and whilst this does have some pink in the trim, that is what sets it of - love the closure too. 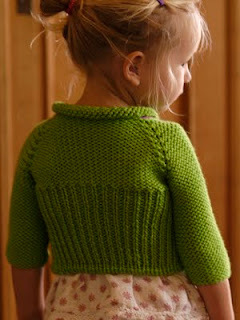 What a fabulous pattern and I love that you chose apple green to showcase it in. 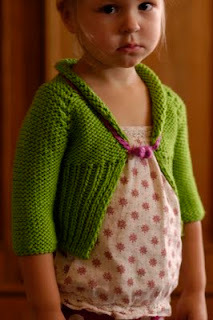 And your little beauties are wonderful models! Another great one!!! And you are so right, it makes it so much more satisfying if they can wear it for a couple of years instead of a couple of months!